The first event will be coming soon. I wonder who will win it. Well, it’s a battle royale format, after all. Probably Najah or Carlos, who were strong even in the beta version. Pisco is also quite famous recently. Who else were there? There is one more, isn’t there? That again? Does he even exist? No, really, there are rumors going around that right at the moment a player is having difficulty with a monster, an arrow comes flying from somewhere with intense speed and kills the monster. Maybe he’s attacking from a range even longer than that of ‘Presence Detection’?! Oh, is anyone still doing the ‘fast legs’ challenge? It has already been a month so surely not hahaha it was a impossible challenge to begin with. Do you know anyone who succeeded? Well, when I was looking at the field from a really high ground the other day, I saw a player moving through the field at a really high speed. I was really far away so I couldn’t figure out if they were a guy or a girl but that’s probably a therianthrope. Sena-chan is slowly becoming famous. Next chapter will also be from a sub-chara perspective. The next day, since school was off, Sena started gaming immediately after breakfast. And like that, Sena decided to wander around the city. Even though it was only the 2nd day after launch, shops run by players could also be seen along with NPC shops. Most of these shops are either material exchange shops or weapon shops but there were also some who opened up diners. Amongst all this, Sena discovered a certain shop. It seemed low-quality no matter how you looked at it. And in fact, that shop wasn’t doing so well, unlike the other shops run by players. The owner even had the expression ‘looks like I’ve done it now~teehee~’ on his face, but in continuous form. There was no one around him……… Being a loner for her whole life, Sena could feel him. That he was also a loner. That he couldn’t fight monsters properly without any friends and probably decided to open a diner. And also spectacularly failed at it. Sena headed towards that shop. Thinking that he would feel better if he sold something at least once before his shop is abolished–a very self-important thought even though she herself was a loner–Sena went to talk to the owner. And maybe because she thought of it like that that Sena had forgotten. Forgotten that she had extreme social anxiety. Sena’s voice had gotten so low that the owner probably only heard ‘o-o-o-o-o’. However, there was no one else there except the owner. And he had immediately understood what she was trying to say. Sena raised her head reflexively and saw the owner’s face for the first time. Convinced why this shop couldn’t sell at all. The owner’s face looked like that of a villain’s from every angle. For example, someone who’s a kindergarten principal but doesn’t look like it and is always teased for it. The owner’s voice reached Sena while she was in a daze. She panicked and took the fried tentacle. ——It’s not that it didn’t look like octopus fry but the purple tentacle was twitching. Sena regretted buying it for a moment there but then thought she had no other choice and decisively took a bite. Although it looks really bad and has a characteristic smell to it, once you actually eat it, it tastes pretty much like octopus fry–no, maybe even better. ‘I am glad’–the owner let out a sigh of relief. Mustering up her very little amount of courage, Sena spoke up. Sena had reached her limit. Having social anxiety, Sena felt like she would go crazy if she talked any longer. In the first place, it had been a long time since she spoke to anyone other than her parents. Even if she had to go to the convenience store, she could get by with shaking her head sideways or up and down. And so, Sena ran away with full speed. She crossed a few players along the way but as her agility was high to begin with and she had ‘Fast Legs’, none of them could catch her. Sena Kohinata is a first-year high school student with extreme social anxiety, which left her friendless and alone. One day, she decides to play the game ‘Another Dimension World Online’ in order to help with her anxiety. 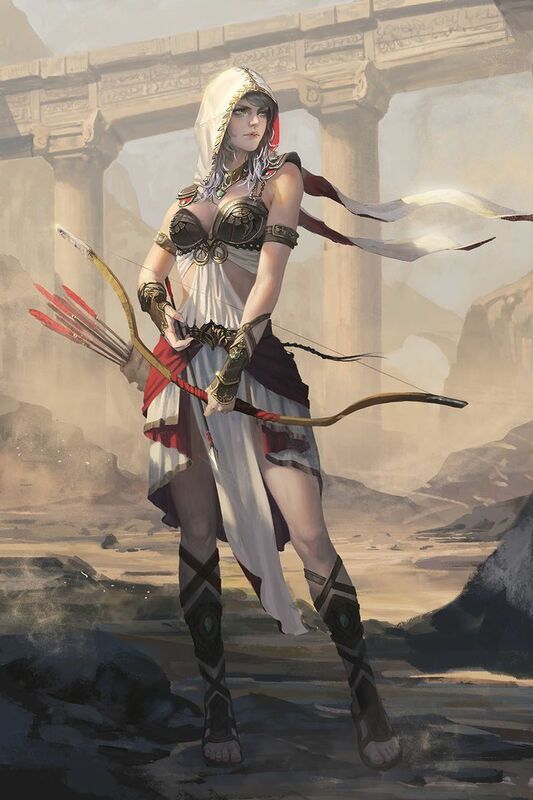 She uses her experience in archery, which was her hobby and sharp hearing which he honed through being a loner, as she challenges herself with this VRMMO! When Sena opened her eyes, a scene that she had never seen before was spread out in front of her. Numerous stores and buildings lined a road that was not paved with asphalt, but actual bricks. She felt as if though she had traveled back in time. As she admired the scene before her, a high pitched ping echoed in her head. And then a menu appeared in front of her eyes. This menu was set up so that no other players could see it unless you wanted them to. Sena tapped the message category. ‘Welcome to the city where it all begins. Arunima! That was the content of the message. Sena thought and immediately started towards the open field. Sena turned to face them. It was a party of two men and one woman, and the human male, who appeared to be the leader was talking to her. The elf woman and the beastman also smiled at her. They seemed to be incredibly kind players and were clearly not beginners themselves. She was panicking like never before. She said before dashing away from them. However, since her voice was so weak and her high AGI had made her so fast, the party of three had barely heard her last word. They just stood there with mouths open in surprise. Sena found herself in a random location in the field. She was now overcome with a feeling of self-disgust. They had been so kind to approach her, and yet she had treated them like that. One of the purposes of this game was to help with her social anxiety, but that would surely be a pipe dream if things continued like this. And there was one other problem. Sena Kohinata had become lost within thirty minutes of starting the game. A voice echoes in her head. Sena pushed aside her worries for a moment in order to check the skill. Skills in AnoDim were divided by 6 ranks. E, D, C, B, A and S.
Sena had continued to run nearly nonstop, or as much as her stamina would allow, since starting the game. And so she had blown past E and arrived at D.
She thought and began to search for enemies. All of the weapons in AnoDim had proficiency levels, once you reached those levels, you would be able to use those weapons’ skills. Through this, even weaker weapons could be useful if you used them enough. Of course, rarer weapons had unique skills. Leaving that aside for now, Sena’s ears began to twitch as she looked around her. Sena looked in the direction that she had detected something. It was a rabbit monster. Sena almost forgot herself as she looked at the adorable animal, but in the next moment, it attacked her. Sena frantically moved away and took out her weapon(Beginner’s Bow). There was no limit to the number of arrows that you could use. All you needed to do was make the command inside of your head, and you would have as many as you needed. You would also be able to use many different kinds of arrows once your bow skill went up, but that would come later. The arrow she unleashed flew through the air with a loud cry and caught the rabbit right between the eyes. It let out a little squeak before falling down and disappearing. Even then, it was usually quite hard to kill this enemy with one shot. And she had only been successful because she had hit it perfectly in its weak spot. Sena frowned as she suddenly detected enemies around her again. This time there were many of them. Apparently, she had back off right into the domain of the rabbits. Twenty rabbits now appeared right in front of Sena. And that was how Sena vs the Rabbits round 2 started. After that, she had run away from the pack and shot one rabbit. Then she ran away again and shot another rabbit. Rinse and repeat. Sena was incredibly tired by the time all of the rabbits were dead. The voice echoed again in Sena’s tired mind, and she instinctively opened the skill screen. ‘Skill: Fleet Foot C’ AGI is raised a lot. ‘Skill: Clairvoyance E’ You can see far away. ‘Bow Skill: Sniper D’ Firing range is increased. This skill affects all bows and arrows. Sena immediately tried using Clairvoyance. Sena thought as she logged out. And so ended Sena’s first day in the VRMMO. I got this song stuck in my head today and decided to share it. Used to add a song of the day to my posts before. Technically I have this stuck in my head since last month when I watched the Taiwanese drama. It is a beautiful song. As class was finished and school was over for the day, many students began to leave. This was Hirasaka, a girls-only private high school. It was moderately well-known in Japan. And in one first-year classroom of this high school, was a student who sat in a corner and gazed at the girls who were chatting around her. Her name was Sena Kohinata. In spite of it being two months since she first enrolled at this school, she was still a loner without a single friend. Sena was the only child of a reasonably well-off family. But as her health was rather delicate, she had been hospitalized from a severe disease before entering kindergarten. Ultimately, she had not attended kindergarten once before starting elementary school. Even then, she would often have to skip school due to her illness, which meant that she rarely had the opportunity to talk with anyone other than her parents. And so she was unable to approach others, and because she was also unable to answer any who approached her, she did not make any friends. She had trouble making friends in junior high school for the same reason, and she remained alone. Once she graduated from junior high school, her parents had to relocate for job-related reasons, which resulted in her transferring to Hirasaka High School. Of course, she was not able to make friends here either and was left alone. And as sixteen years had passed, she was now starting to give up. She thought as she enjoyed her life as a loner. The girls around Sena had not gone home yet and continued to stay in the classroom and talk with one another. Curious about what they were saying, Sena perked up her ears. She understood what they were talking about. It was a new VR game called ‘ANOTHER DIMENSION WORLD ONLINE’ or AnoDim for short. Massive open fields, numerous weapons, and skills, quests that were overflowing with content, many species of monsters, the overall high production values had garnered it much attention worldwide ever since it was announced. And the release date was today. There were many in Sena’s class who had already decided to buy it. While she was a loner, Sena had only a little experience with video games. Her hobby had always just been archery. In fact, her skill was high enough that she could possibly win national competitions if she wanted to, but her social anxiety kept her away from competing even once. However, the beauty of the AnoDim trailers had caught her eye, and though hesitant at first, she decided to buy the game. She asked her parents for permission, saying that it would help her with her anxiety. There was no reason for her parents to be against it. Sena was in the top of her class, and it would be good if this could help her. And so today was the first day where Sena would start an online game. She got up from her seat and left the classroom behind her. She said as she entered her house. She was greeted by her mother, Shizuru Kohinata, who was a housewife. Try to make at least 100 friends! Her mother said jokingly as Sena left her and went up to her room. When she entered her room, she saw that there was a large cardboard box on the floor. She spent a whole hour just reading the manual and calming her nerves. She told herself as she put on the headset and lay down in her bed. Her heart was beating so fast that she thought someone might hear it. She closed her eyes and tried to make her heart settle. Sena was in a world full of darkness. Even when she opened her eyes, there was nothing to see and nothing to hear. She panicked for a second before it began. A cheery voice echoes in her brain. Sena was a little shocked at the awful name. Gaiko ignored her and continued. Just as she heard these words, a keyboard and name field appeared in front of her eyes. Her heart raced at this new experience. She began to type in her name. It was a name she always used for game protagonists. And here a list of various races appeared before her. Beastfolk: They boast high physical abilities but low aptitude for magic. Elves: While their physical abilities are low, they have a high aptitude for magic. Dwarves: High strength and skill. Very productive. Dragonkin: They boast even higher physical abilities than the beastfolk and moderate aptitude for magic. However, their growth is very slow. Humans: Both physical abilities and magic aptitude are standard. You can’t go wrong with this choice! Random: There are rare races that are Random exclusive. Will you try your luck!? Sena’s eyes stopped at the explanation for Random. Without thinking too much, her finger neared the Random button. Gaiko’s belated warning made Sena jump a little. …moved over and pushed the Beastfolk button. Sena thought satisfactorily to herself as Gaiko continued. A new screen appeared in front of Sena. Sena distributed her 100 points like this. Gaiko announced. Then Sena’s body was enveloped by light and her vision became nothing but white.